Chinese flying lanterns are also known as Chinese sky lanterns. They are lightweight, paper lanterns constructed of tissue paper on a bamboo frame that are open at the bottom. When a fuel source, such as a cotton ball soaked in rubbing alcohol, is placed at the open bottom of the lantern and set alight, the heat fills the lantern much like a hot-air balloon and the lantern takes flight. Fireproof the blue tissue paper since it will be used for the bottom of the lantern that will be near open flame. 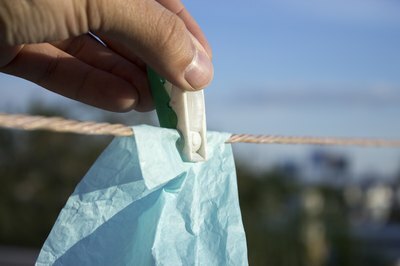 Hang the tissue paper on a clothesline with clothespins. Spray with the flame retardant until saturated. Do not spray the corners where the clothespins are; that area will not be used in the lantern and if they get wet the paper will tear. Allow to dry. 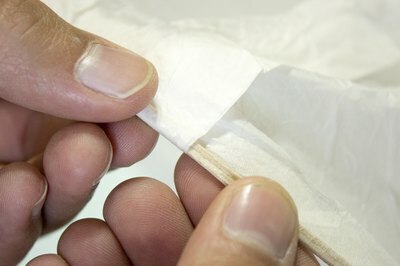 Glue each sheet of blue tissue paper to a sheet of white tissue paper along the edges. Let dry. Cut a lantern panel from each of the glued tissue paper panels. Use the pattern you made from craft paper. 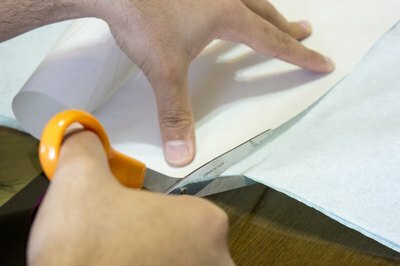 Remember to place the flat bottom of the pattern on the blue portion of the glued tissue paper panels. Glue the panels together at the sides, making sure the top is sealed where the pointed ends come together and the bottom is left open. This will form a large bag. Let dry. 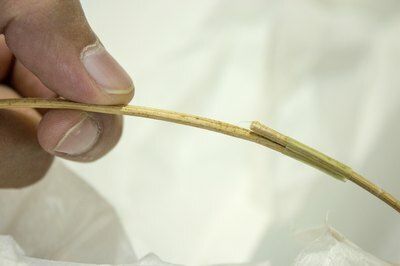 Make the bamboo hoop for the bottom opening. You can find bamboo strips in the craft supply store. Bend the bamboo strip in a circle to fit the bottom opening of the tissue paper bag. 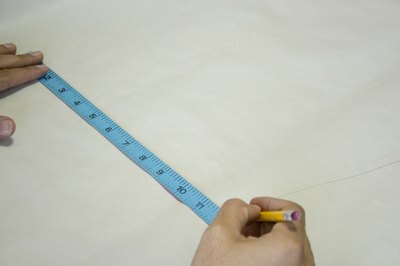 Cut two lengths of wire slightly longer than the diameter of the bottom of the tissue paper bag. Twist these tightly around four equidistant points on the bamboo hoop, forming an X. 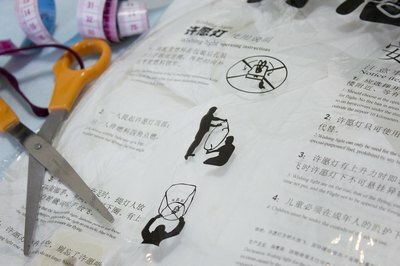 Glue the bamboo hoop around the bottom of the tissue paper bag and let it dry. Now the lantern is ready to fly. To fly, pull a cotton ball apart slightly to lengthen it, soak it in rubbing alcohol, and drape it over the wire in the center of the lantern. When you light it, the heat will cause the lantern to float upwards. Use waxed paper under the tissue paper when gluing it so no paper sticks to your work area. Do not use hot glue for this project. The temperatures in the lantern will cause the glue to liquefy and the lantern will come apart. Exercise extreme caution when flying the lantern because it contains an open flame that may ignite anything it comes into contact with. Make sure not to use too much burning material so that the flame life is only a minute or two. How to Make a Firefly Lantern From "Tangled"